Add life to your side table and start a conversation with guests when you feature your own photo personalized drink coasters at your next gathering. Looking for a unique way to showcase your most cherished photos? Or, perhaps you want to add a personalized touch to your dining décor. Our custom printed coasters are ideal for dinner parties or simply displaying on your coffee table to protect your wooden furniture from unsightly water rings. Both practical and stylish, they make the perfect dining accessory or a thoughtful gift for a loved one! With just a few easy steps, you can create personalized coasters with your favorite photos, text and variety of backgrounds. Begin by choosing your photos from your computer or smart phone and allow our project builder help you put your own custom design together with ease. First, choose your coaster photo option. You can print the same photo or different photos for your set of six. Next, choose your coaster style to accent and display your photos. Then, upload your photos from your computer or phone. When you coaster set loads in the project editor, you can choose a template and add your own photos and text to complete your design. Once you’ve finished, simply add your coasters to the cart and place your order. Your new custom printed coasters will look great displayed on your living room coffee table and are sure to garner attention from visiting house guests. 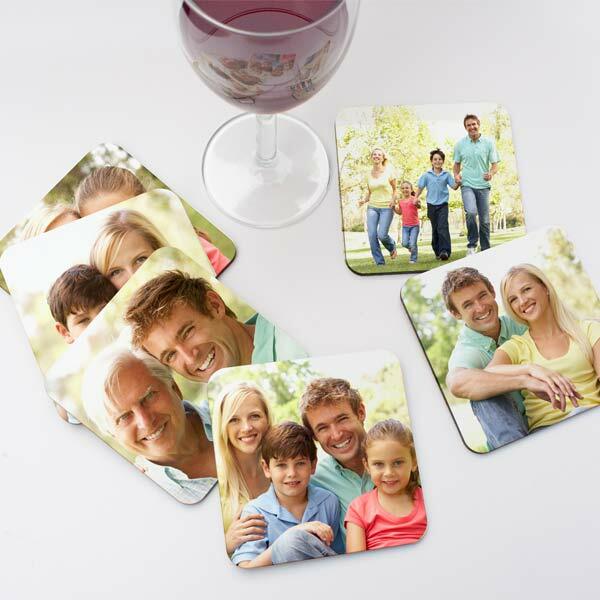 Our drink coasters not only protect your furniture but showcase your favorite memories for everyone to enjoy. We all have them. Photos stored away on our computers and smart phones. Many of these amazing moments remain out of sight for years. Why not celebrate them and create your own photo coaster set! They’re a fun and unique way to showcase your best memories while adding a little character to your dining décor. Maybe you took some photos of the kids during your last camping trip but just haven’t gotten around to printing them. Use them to create custom photo coasters with personality! We have a large variety of templates to choose from that are perfect for accenting your best camping memories. Whether it’s wedding photos, graduation pictures or fun family snapshots, they’re sure to bring smiles to everyone’s face. Our photo coaster set looks great no matter where it’s displayed. Showcase them on your dining table during your next dinner party or keep them on your family room coffee table so family and guests have somewhere to put their ice cold drinks. They’re sure to start conversations at your next gathering! Even better, you can choose from a variety of templates. We have a whole rainbow of solid colors, designs and various patterns to choose from so you can compliment your décor. Whether your home is modern or rustic, we have a photo coaster design just for you. Our custom photo coasters make a wonderful gift for any occasion. Whether you’re searching for a unique Christmas gift or you want to give your friend something personal for her birthday, you can design custom printed coasters for anyone on your shopping list. You can also design customized dinner mats to accompany their personalized coasters for a unique dining decor gift set. Maybe you want to create something special for your favorite aunt for the holidays. Why not upload some of her favorite photos to MyPix2 and design personalized drink coasters just for her. You can display each photo with a template that fits her style for a gift she won’t soon forget. If you have a friend or loved one moving into a new home, our personalized photo coasters make a great housewarming present. Come up with a custom layout to match her personality and style. With our easy-to-use project builder and a little creativity, you can make an amazing gift that’s guaranteed to be well received. With our convenient project builder, you can easily upload your digital images and use them to create personalized photo coasters that both unique and practical. You can choose to print the same beloved photo on your new photo coaster set or print a series of pictures to showcase an array of memories. We have several custom options to choose from and you can easily make a set for yourself or a loved one for a unique gift. Use them for your next dinner party table setting or keep them in your living room to protect your wood furniture from cold drinks. Our personalized coasters are a fun way to relive your best memories while relaxing at home and enjoying your favorite beverage.